At the beginning of this year TBH (the better half) and I decided that we would go to one very good restaurant a month. If you go at lunch time and stick to the set menu, you can actually pick up a really good deal in what would otherwise be a wallet-busting day out! So I set about creating a bucket list of restaurants I want to try. We started off well with lunches at The Ledbury, Texture and Dabbous (while you could still get a table this side of 2012). But then my dad sadly passed away and life got pretty busy for us and nice lunches were less of a priority. It is now some months later and it’s time to pick up where we left off…. Pollen Street Social is the first solo venture of former right-hand man of Gordon Ramsay, Jason Atherton. A man who has also worked with the likes of Pierre Kaufman at Le Tante Claire and the first Brit to work with Ferran Adria at the 3 Michelin star El Bulli in Spain. So you just know it’s going to be good! As soon as you walk you in, you get what Atherton was trying to do. The interior is all wood and leather and noise! This isn’t what your typical Michelin star restaurants look like. Not only has he put ‘social’ in the name, but it’s in the feel of the place too! Fine dining in a totally relaxed atmosphere. We decided before we even sat down that we were going to stick to the set menu. I have a tendency to SAY I’m going to have the set menu and then get distracted by the a la carte. I didn’t even look because the set menu just read so well. And at £24 for 2 courses or £27.50 for 3 courses, that is just amazing value! While we were choosing, the waitress left us with a few little “snacks” (again – out with the poncy ‘amuse bouche’ and in with the less formal snack.) Pork crackling that was more prawn cracker in texture than rock hard pub pork scratching, with a gorgeous mustard dip that looked like melted butter. A salt cod spread that was so tasty I wanted to lick the bowl it came in! Salt cod is really strong flavoured and knowing TBH, I was very surprised that even he liked it. There were also some really good olives. For my starter I chose mackerel with BBQ cucumber and horseradish cream, because I have only ever had mackerel once. Shocking, considering how much I love fish. When it came it looked as pretty as a picture! The flavours were Asian inspired and with the added mooli on the plate (something else I have never tried!) it made the dish really interesting. The dish was served cold which I wasn’t expecting and it looked like the mackerel had only been blow-torched. I can’t say I loved it, but it was different from anything I have ever tasted. The tastiest part of the dish for me was the horseradish cream, which is a shame because the mackerel should’ve been the star of the show. 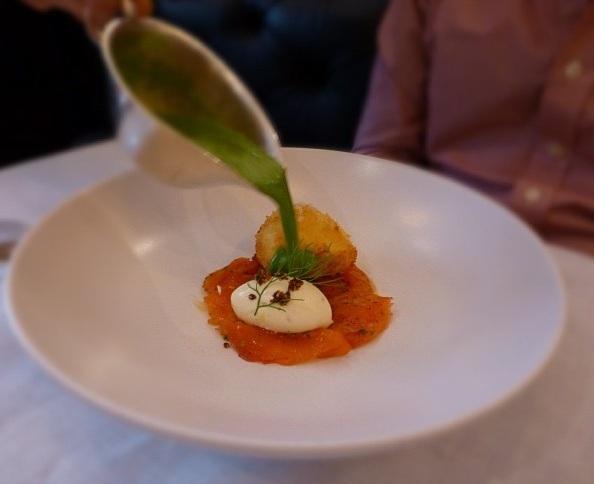 TBH chose the truffled hen’s egg with London smoked salmon and watercress soup. I am assured it was as gorgeous as it looked! I definitely had some plate envy going on, especially when he cut through the egg and the yolk just burst out like a jack-in-the-box! I stuck to fish again for my main dish. Halibut is one of my favourite types of fish and when I saw it on the menu, it was a no-brainer. Served with a shellfish salad, bouillabaisse and liquid potato. Sounds interesting, doesn’t it? And it was! The bouillabaisse was full of fishy flavour and I just loved the way the two liquids were poured into the plate that made it look a bit like ying and yang. I’m not sure if that was intentional, but it looked and tasted great all the same. My only gripe was that the seafood salad only consisted of clams. Salads to me are made of lots of different things and it would’ve been nice to have some other shellfish in there. TBH had the 18 hour braised Angus feather blade with baked celeriac and marrow crumbs. It looked amazing! I had a little taste and the meat was so tender it just melted in your mouth. After our meal came a pre-dessert. The waitress told us to stick the spoon in all the way to the bottom and make sure that we got every layer. We did this and what we got was a sharp raspberry sorbet, soft meringue and then little balls of what tasted like white chocolate at the end, but couldn’t have been because they just melted away like little raspberry icicles. Neither of us fancied a dessert after this, the pre-dessert was all I needed. But the waitress managed to talk us into sharing the English rice pudding with goat’s milk, mango and ginger. It made me think of a dear friend of mine who totally (and very vocally) dislikes anything that comes from a goat! “It just tastes like a farm yard!” Rest assured it did not taste anything like that at all. It was creamy and packed full of vanilla. The mango and ginger sorbet brought sharpness to the dish that just cut through the rice pudding and actually made the whole dish feel quite light. Very clever! While we waited for the bill, we were given apple and almond parmentiers. Goo’ey in the centre with the lightest crisp on the outside. You just have to love all these little extras! The waitresses were sweet and attentive, and the sommelier made some excellent recommendations. But the service didn’t feel as slick as it does in some other Michelin star establishments. Maybe that’s the aim, with it being a more relaxed type of dining? Incidentally, TBH disagrees and thought that the whole experience was the best he has had in a long time. Our bill came to £112 which included service, 2 glasses of Prosecco and 3 glasses of wine. For that level of cooking and the fantastic atmosphere, it’s an absolute steal!